On Tuesday, Jordan convinced me to go to my first “Casecamp“. There were about 4 presentations 15 min. each with questions afterwards. Most of the technical mumbo jumbo went right over my head, but there were a few moments when I was like “cool!”. And after spending the last few months running with Jord, and listening to him babble on about SEO, RSS, CSS, and whatever else he talks about, I had a more firm understanding of what they were talking about than if I would have went to something like this in January. Jordan also just had me build a website for a client of his (a very simple one), and I created my own blog (this one!) recently, so a lot of this information is starting to sink in. 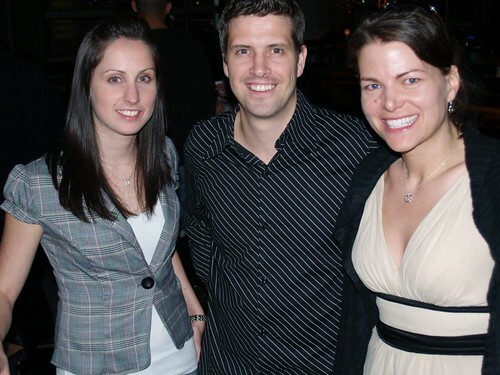 Below is a picture of myself, Jordan and Joy Boyson, the great gal who put together the whole Casecamp Vancouver 2 event. You never know, you might catch me at more of these events in the future! Previous Previous post: Something to Celebrate!